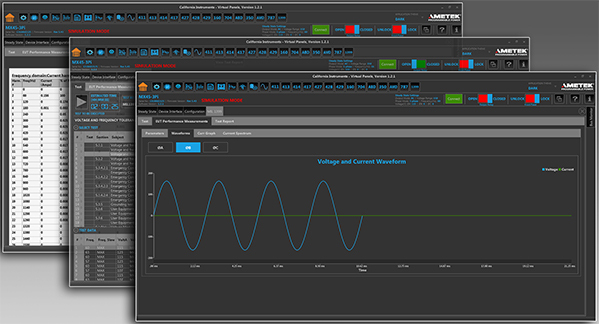 San Diego -- AMETEK Programmable Power, the global leader in programmable AC and DC power test solutions, has introduced a Shipboard Power Test Software Option compliant with MIL-STD 1399 Section 300B of the Department of Defnese Interface Standard for Electric Power, Alternating Current. MIL‑STD‑1399 300 Revision B defines the electrical interface power requirements for shipboard and submarine equipment. This military standard section establishes electrical interface characteristics for shipboard equipment that uses AC electric power, as well as requirements and test methods to ensure compatibility between user equipment and the electric power system. The latest version of the standard, Revision B, covers both fixed 400 Hz and 60 Hz frequency. The new MIL-STD-1399-300B Shipboard Power Test Software option covers all power groups included in the test standard. The test option operates through the California Instruments Virtual Panels Graphical User Interface software, which is provided for all of the AC power sources above, and the MIL 1399 tests can be operated from the MIL 1399 test screen. For more information on MIL-STD-1399-300B Shipboard Power Test Software or any of AMETEK’s programmable power supplies and programmable loads, contact an authorized sales representative by visiting programmablepower.com/contact. AMETEK Programmable Power also can be contacted directly toll free at 800-733-5427 or 858-450-0085 or at sales.ppd@ametek.com. AMETEK Programmable Power designs, manufactures and markets precision, AC and DC programmable power supplies, electronic loads, application-specific power subsystems, precision data acquisition instrumentation and signal switching, and compliance test solutions for customers requiring and valuing differentiated power products and services. It offers one of the industry’s broadest portfolios of core ATE components under the VTI Instruments, California Instruments™, Sorensen™, and Elgar™ brands.